Stock market runs based on speculations. The definition of speculation is ‘the reasoning based on incomplete information.’ In stock markets, buyers and sellers would do the trading of shares (also called as company stock). During this buying or selling both the parties would come to an agreement before trading and would exchange the stock at that price. Stock Exchange is the facility where the shares and derivatives would be traded. This facility works like an office with fixed working hours and days. Companies, generally, list their shares in any Stock Exchange where the buyers and sellers carry the trading activity. Each country has at least one national stock exchange where both domestic and international businesses can offer their shares for trading. Stock market helps the businesses to raise money for their endeavors. With their stocks traded well in the exchange, companies can expand their existing product/service portfolios or can get into diversification of the business. Stock exchange also helps the investors in terms of liquidity and offers a steadfast platform for trading. The transactions carried out through a stock exchange are secured as the stock exchange regulates and ensures the payments and receipts of each transaction. On whole, a healthy stock exchange is the symbol of a robust economy. Buyers and sellers are the active participants of any stock exchange. They could be either individuals or business firms (also called as trading houses). Financial organizations, banks etc. are called as institutional investors while a person is called as individual investor. These investors could include a small individual investor to a big trader of large funds. The quantum of trading of different stocks results into the fluctuations of the stock market and indicate how strong or weak an economy is. Stock markets are driven by two trends i.e. Bullish and Bearish. Bull-run of a stock market means the upward surge in the overall trading and Bearish run indicates the opposite trend i.e. downward slide. As we saw, at the beginning of this article, that the stock markets run on speculations, at times the euphoric speculations can drive the bull markets while desperation can tear the markets down with a bear’s tight hug. Stock market trading comes with associated risks on account of successful or failed speculations. Owing to the slack economic transactions, venturing in to the stock markets as well as sustenance with them is not that easy as one can think. It is but imperative for any investor to study, analyze and understand the trends of various stocks and predict the future movements of them. Trends indicate the behavioral patterns of various stocks, securities, derivatives etc. By piecing them together, one can arrive to a conclusion that appears as logical and represents the truth. Hence, investors must use the trends to take concrete steps that which yield the positive results. On contrary, a slight slip in judging the trends of the market can lead to greater financial disasters. Hence there is a need to have some mechanism which can predict the outcome of a speculation by assimilating and analyzing the relevant data pertaining to the market and financial transactions. That mechanism should have the scientific approach and shall involve the deployment of several analytics which can ensure safe trading. Technical Analysis of stock markets is one of the proven methods that which supports the investment decisions in an innovative way. This technique works differently as compared to the conventional methods like Fundamental Analysis. In Fundamental Analysis, the characteristics of a company like products, earnings, launch of new products, dividends etc. will be analyzed thoroughly before taking a decision on trading its stocks. But the Technical Analysis is different wherein the characteristics of the company will not get any priority but it considers the behavior of the securities of the company in the market and puts the statistics to analysis and derives the patterns based on which decision can be taken. Technical analysis is a ‘data mining’ method wherein the large databases would be critically analyzed to find the relational sequences between various data fields. Stock markets contain very large data which comprises of stocks, their rates over the period, fluctuations, purchases patterns, buying trends etc. Thus the stock market database is having two independent but interdependent systems i.e. (A) Transactions and (B) Analytics. Technical analysis is the method used to link these two systems and derive meaningful observations which can be utilized for future requirements. To do the technical analysis, technicians gather financial data from the past, analyze it from various prepositions, create pattern charts and arrive at the final outcome of the data analysis. Technical analysts use many tools like market indicators, price transformations, data inputs (advancing and declining) etc. and all these parameters help the analysts to make the assessments of a particular stock and arrive at its trends. The models used in technical analysis include various volume and price transformations like moving averages, regressions, relative strength index etc. It also includes inter-market and intra-market price correlations, stock market or business cycles and et al. and various charts would be prepared to identify the trends after assimilating the entire data. It would sound crazy to know that this technique was totally rejected by the experts during 1960s and 70s. But subsequently several reviews done on this technique have revealed that technical analysis has yielded positive results and hence technical analysis can be used on a wider scale. But there were certain threats observed like data dredging which is nothing but the inapt usage of data mining. This data phishing has lead to the deterioration of quality of technical analysis. Some of the academicians too are not in support of technical analysis as they find this technique as not only superficial and conflicting but inconclusive as well. There is no single technique of this analysis and there are many types of it like Dow Theory, Candlestick Charting, Elliott Wave Theory etc. There are analysts who devise their own methods by mixing the critical parameters of these techniques. Some analysts use mechanical methods like using computerized charts etc. 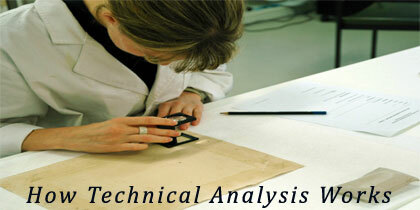 to carry out the technical analysis. We have seen in the previous sections that Technical analysis considers the price movements of a particular stock and then tries to reason out the future patterns. This practice is contrary to the conventional method called Fundamental analysis. We have also seen above that the Fundamental analysis not only considers the price but many other factors related to a particular company to get a complete insight.